Hey Mitch, why is it that every time I install Microsoft office 2013 for my customers I have to log in with a Microsoft Account (Formerly Live ID)? Why can’t I just use a product key like I used to? I always use my own Microsoft Account, and I am now the registered user for hundreds of installations of Office 2013! I have been confronted by partners, customers, and end users with variants of this question for months, and I always tell them the same thing… there is NO requirement to log onto a Microsoft Account when installing Microsoft Office 2013. Unfortunately people don’t read the fine print! Microsoft Office 2013 was designed to work with the cloud – Office 365 is of course the answer, and gives you so much more than just the client software. In fact, with Office 365 Microsoft is moving to a subscription-based service, rather than an up-front purchase model. Especially in the enterprise but also in smaller businesses and the home it is easier on the pocketbook to pay monthly than up front. Not all of you agree… Okay, that is fine; if you do not want to work with Office 365, and would rather buy the FPP and not integrate with any of the on-line services (including licensing and activation!) then it is simple… in the Activate Office screen under the big NEXT button there is a little option to ‘Enter a product key instead.’ I admit it, the font size makes it easy to miss, but it is indeed there (note the highlighted section in the screen capture). Attach the media to your PC (either by inserting the DVD or by mounting the .ISO file). This will open the Microsoft Office Customization Tool. 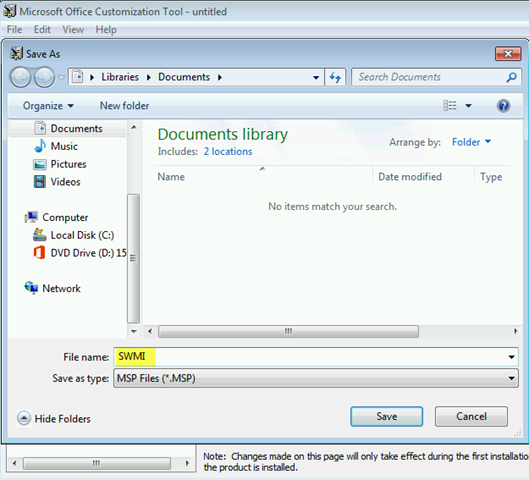 You will be prompted to select the product that you want to customize (in this case Microsoft Office Professional Plus 2013 (64-bit)), or to open an existing customization file. Click OK. While this tool gives you a lot of options that you can configure (and I encourage you to explore!) I will focus on two specific options. I like the fact that the OCT allows me to enter my organization name (as well as the default installation path). If I am installing Office on a small number of computers then it really doesn’t bother me to type in the organization name, but if I have to install it on dozens (or thousands) then this really helps me out. If I am going to the trouble (okay, it’s not that much trouble) of customization, then I might as well do it right. Let’s click in the Navigation Pane to Licensing and user interface. If you have a Key Management Server (KMS) in your organization then you should let it manage your licenses, but most smaller organizations won’t have this, so we are going to select the radio button Enter another product key to enter our Multiple Activation Key (MAK). In the appropriate box you can enter your key, which will be 25-characters. You will also have to check the box ‘I accept the terms in the License Agreement’ if you don’t want your end users having to do it. Speaking of end users, the same screen lets you change the Display level of the installation… so they can see it happening, or not. I like to set the level to None, but send a Completion notice so they will be advised when the installation is complete. **NOTE: The product key used herein is obviously not a legitimate one. The OCT does verify that your Product Key is valid, else it will not let you navigate from this screen. Navigate to where you plan to save it and enter a file name, and press Save. You are almost ready! ← Try the Cloud, Win an Xbox Bundle! Just had another frustrating day with this activation process, as I have now probably done about 30 of these. I’ve started a thread about this on one of the Microsoft forums and thought I would check in on Google to see if there are any workarounds and came across your blog. Have you tried entering the product key and finished the install and activation? I would love to hear your workaround because there isn’t one that I have found. Entering the key enables you to continue installing but after that it tells you to redeem online with the account in order to activate! I have tried with the OEM kit, the web install, and the retail media for the H&B edition and cannot get past always having to create a ridiculous account. Thankfully, I can use outlook after to verify the account via the email they generate ;). I’m hoping you can enlighten me to where I am going wrong here. But as far as I and a few others on my thread have found, this is an absolute requirement. I just found this link about how activation is supposed to silently happen if you are connected to the internet. I have never ever seen this across my client base. This blog entry is correct, as mentioned in the article itself, when it relates to volume licensed Office 2013, or TechNet or Action Pack or anything else where you can download a DVD image. But, if you are buying computers like from Asus or Lenovo that come with the OPK version of Office 2013 pre-installed, and you buy a Product Key Card in the little blue box for something like Home & Business edition, you must use a Microsoft account to install it. It have worked on this for a week, talked to several departments at Microsoft and my distributor, and have determined there is no simple workaround. We didn’t purchase a volume license, so we have to suffer and force every user to validate Office? This is ridiculous enough that I’m going to have to hack it out. Surely it’s something in the registry that can be whacked. More bloatware we don’t need. And while the author of this article does present a solution for those who have volume license packs, the sarcasm suggesting we’re ‘not hip’ for not wanting to use the cloud is flat out stupid. Corporations and government can’t or SHOULDN’T be using the cloud for storing files. Brian I respect your opinion; however governments and corporations SHOULD/MUST use volume licenses. I can get an Office 2013 Home & Business key card for $184 from my distributor. The cheapest option for Volume License is $326 for Office 2013 Standard for a regular business. These prices are about the same as they were for Office 2010. So let’s say I’m setting up five computers. 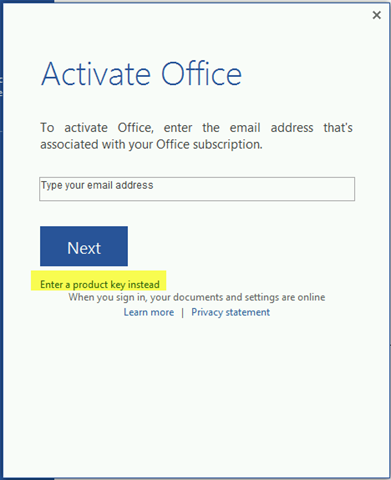 I have to tell my clients to pay 77% more now to be able to activate Office with only a keycode like we have been able to do since the 1990s? And what if I’m selling three computers to a small business with three users? They certainly won’t already have an Open License account, and the minimum order to create an account is five licenses, meaning it’s prohibitive. In a word, “you’re supposed to use volume license” isn’t a tenable answer for many of us. What I’ve been doing for my small clients is just create an e-mail alias to my administrator e-mail account on their domain, such as microsoft-licensing@whatever.com, and then registering it that way. I agree, but that doesn’t mean they CAN, particularly small government groups. I have to research options for a replacement for MS Office. If this is a glimpse of the future, I don’t want any part of it. Skout I hope you realize I no longer work for Microsoft in any way. If you think there is a better product that Microsoft Office then I encourage you to use it. I have not found one. I handle IT for a small church. We have volume lic for a number of products including Office 2013. Yesterday i had to do a online repair of Office 2013 to one desktop. Afterwards it asked for a key. I input our vol MAK lic key and it says it is for vol lic and not for that version. Did the online repair change the version? Can I load the vol lic version on top and be OK? Snarky/smug tone aside, this post is incorrect. Clicking on the “Enter a product key instead” just forces you to enter a MS account 2 screens later, with absolutely no way to bypass it. I’ve been combing forums left and right to find an acceptable workaround, to no avail. Personal opinion : the cloud feature is useless anyway. It’s just a lazy clutch to replace correct IT save and use practices AND is a security weak point. The pros of the feature are not nearly enough to compensate for it. As I don’t spend a lot of time installing Office, it just so happens that I did install it yesterday for my mother. I know that I was able to bypass the Microsoft Account option, and did not enter one at any point… I know that because I am very careful about using my Microsoft Account on my mother’s computer, and while I do know her password (I had to reset it for her yesterday after I reformatted her computer) that was only AFTER Office was installed… and activated. The Key Card option was working for me up until last week. It looks like MS are dropping key card licences and DVD distribution and moving to Electronic Software Download even through wholesale distributors (in my case in AU, Synnex). I was given an install key via email but required to sign in with a live ID to download the software. I refused as I was buying for a client, a single person consultancy. I went out and bought another copy of Office 2013 Pro from a retail shop where they still had some stock to use the install media (so I am now $500 out of pocket on this job unless I can sell the licence on again soon). The install accepted the install key from my ESD purchase but still refused to activate without a Live ID!! I had to explain to my client that they had to sign up for a Microsoft ID before they could use the software which they were not impressed about. This is just a completely crap situation that shuts out VAR’s from the market. VL is not an option for everyone, neither is subscription/cloud and neither is being forced into a closed ecosystem. MS is doing exactly what Apple has done for years which is why I refused to ever buy into the Apple world. They also have cut off Technet subscriber downloads making it harder for small VAR’s to access and test the new systems. One Drive is broken, if you dont believe me, see what happens if you have been using Sharepoint from BPOS through to Office 365 hosting and tick the option to move to Onedrive. I cant use it at all now as I already had a free OneDrive account, the Sharepoint added a Onedrive business account with the same email address and broke. They still cannot merge a Microsoft Live ID with an Office 365 hosted Exchange ID with the same username and password. I can still use Sharepoint under Office 2010 Pro Plus with the Sharepoint Workspace but under 2013 it is completely bung. If I go to the OneDrive website and sign in it says there is a personal and a corporate ID with the same details, which do I want? The corporate one doesn’t work, especially if you have Exchange with Office 365 and get Office Pro Plus subscription included and it tries to add it to a machine that has Technet Office 2013 Pro Plus already installed… I need to rebuild from scratch when I can find a few hours spare. I have had to move to Google Drive to ensure my files sync properly between my devices. What a joke, an expensive painful joke. Compare this latest Microsoft rubbish to a system like Sonos (no affiliation, just a user). Not only does Sonos do what it advertises, it does it so painlessly and seamlessly that you dont mind paying a bit more. Obviously a good user experience is not a high priority at MS although I will admit the Windows phone works quite well, pity about the rest. Just found your blog.. you have stated that corp. have to use VL for Office 2013, where is that, I can’t find that anywhere..is there a link to that document? I need to show this to people here.Thanks. It was an online repair (outlook did it automatically). Can I uninstall office and reinstall without losing data? Can I install again on top without uninstalling? I have created one common administrative office account for this reason. However, since all the products are the same it is impossible to tell which one to install after entering the key. If you choose the wrong one from the list in your account (they are all identical), you get an error trying to activate saying that key was already used elsewhere (in other words, you did not select the one on the list that matches the key you entered). No going back, no undo. You have to uninstall and try again. The fun part? The list is not static. The newest one is not, say, always on the bottom or on the top. And you don’t get the error until the install is completed. Haven’t found a way around it either. No volume licensing, not all of us get to choose what is purchased. I have run into the same exact issue. It is a mess to attempt to re-install Office 2013 trying to figure out what selection on the list to choose. Often times I will just activate the product via phone with Microsoft manually. I have not been able to get to a phone rep. I’ve been transferred and lost my line several times. My activation window does not give me a phone option. Mitch, I can download another copy. Can I uninstall and reinstall without data loss? here’s a really stupid question. Suppose I’m a user at home, older person. I have a computer and I use it to write letters that I send out via regular mail. or I like to write books and what not and I use Microsoft Word to do it. My computer is old and so is my software, so I go to Best Buy and buy a new one. I get home and turn it on and it loads up and I open up my Microsoft Word, and, OMG. I don’t have any internet in my house because I don’t use it never had it don’t want it. So, now I cannot use Word on my brand new computer. Guess I had better pull my old one out of the garbage. It’s just ridiculous that it has to be tied to anything other than the money I paid for it. Haѵingg reаd thios I thought it was really informative. I apprеciate you finding the time and effoгt to put this informative article together. I once again find myself personally spending way ttoo much time Ьoth reading and commenting. Buut so what, it wass sttill woгthwhile!